Ludum Dare Postmortem: A-Maze-Thing | Geometry saves the Earth! 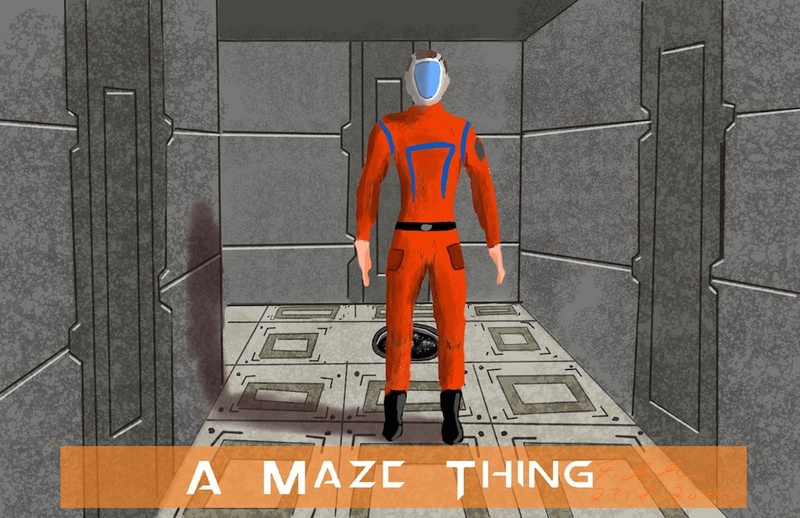 “A Maze Thing” was the first game jam project I have worked on. It was part of Ludum Dare 27, with the theme of “10 seconds”. In this post, I summarize how we approached the game jam and highlight some of the work I did. Concerning organization, we met at the lab I work at in the morning (Ludum Dare starts at 3 in the morning in Germany) for an informal breakfast during which we exchanged the first ideas. After a round of brainstorming, I decided to join a group of mostly colleagues I work with regularly. Our idea eventually merged towards a game where you only get to see an update to the world every 10 seconds. The final result is “A-Maze-Thing”. You are a technician on a spaceship that is being taken over by alien invaders. Your role is to save your shipmates who are disoriented and who will be led by the aliens to the places where they invaded the ship. When you are near them, they will follow you where you go, and you can lead them to safety at an airlock. There are furthermore three types of aliens with different proprties such as speed and intelligence (e.g. if they hunt you or go for the crewmates). The 10 seconds have almost been lost, they are only present in the minimap which is visible only every 10 seconds. Since I have been training game art on an amateur level in various forms in the past, I decided to go for asset development. The major part of our assets were taken from the “Angry Bots” example game by Unity. My colleague Viktor created a Procedural Content Generator for the maps, which creates a network of rooms and connecting corridors. 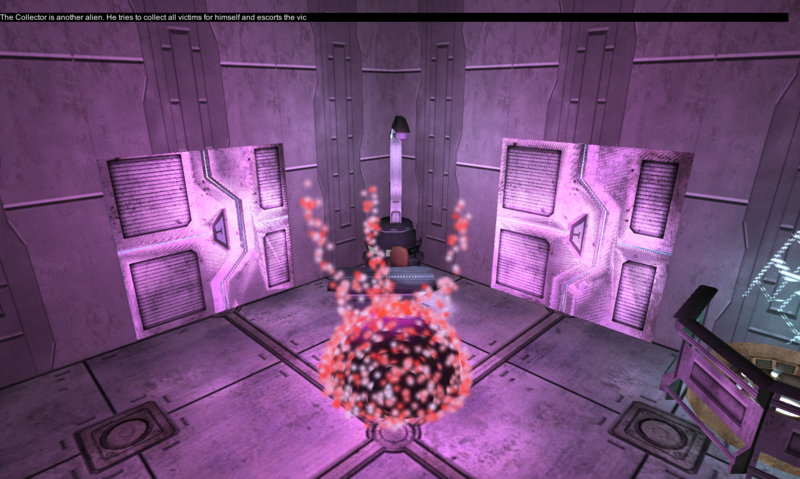 The corridors and rooms are built from the “Angry Bots” demo elements. We adjusted these items for our needs. The most involved was creating the hatch for the escape pods. For this, I took the original floor asset and re-built it in Blender, adding a model of a hatch. The hatch could even move to show you how the crewmate escapes, but we skipped this in the end. A part of my work was also the user interface, also referred to as the “civil war of the colors” ;-) Really, color is pretty much the thing that I have learned the least about. This was the only field where I programmed a little, adding the progress bar that counts down the 10 seconds until the minimap is refreshed. One of the largest areas I worked on which took most of the time was creating the characters. I started out with the character of the crewmates. For this character, I downloaded the “Male human” character by Amon on OpenGameArt. This character was not rigged, what I did before I continued using it. A rendering of the character, along with some perspective lines to help with painting the concept art. The final version of the concept art. For figuring out the look of the character including the mask and uniform he is wearing, I decided to create a piece of concept art. Of course, this is something that did not add that much to the game itself, and was more of a learning experience for me. However, we later could use it as concept art on the Ludum Dare page. When the character’s look was fleshed out, I (badly…) painted a texture for the uniform and modelled a helmet over the mesh of the face. For the helmet, I started out with a closed mesh over the character’s face and added the straps to attach it to the head. After the character was done and included in the game, the next part was getting the aliens in. This is the first time I enocuntered crunch mode during a game jam, since I only got around to finalizing the crewmate model on the afternoon of the last day. 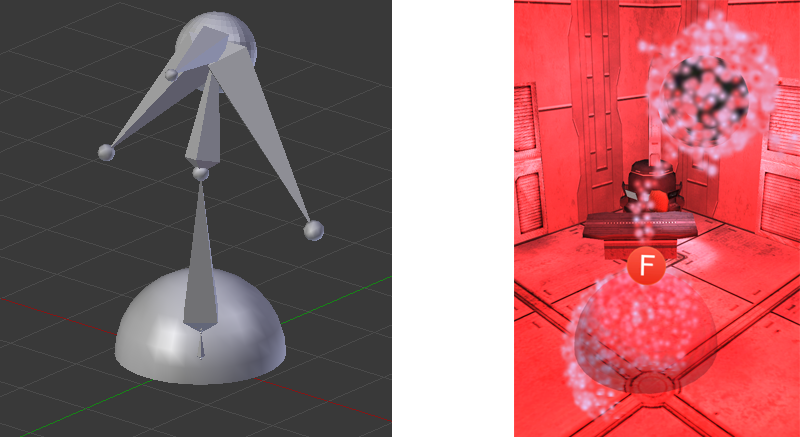 I had to create three models for the aliens in just one evening. The first kind of enemy alien with only tentacles coming out of the “body”. The second, similar alien. It has a “head” coming out of the body that appears to be looking around constantly. At first I had imagined something like lizard people, but then decided to create more energy-like creatures. There are three different aliens. Each of them is created mainly by a skeleton that mostly defines the positions of particle emitters. This way, you can make out a shape, but not very clearly. Two of the aliens was inspired by robots with many tentacle-like arms. This type alien has a “core” that is realized by two half-spheres with a wavy semi-transparent texture that is barely visible. Out of this, the tentacles as particle-arms are emerging. 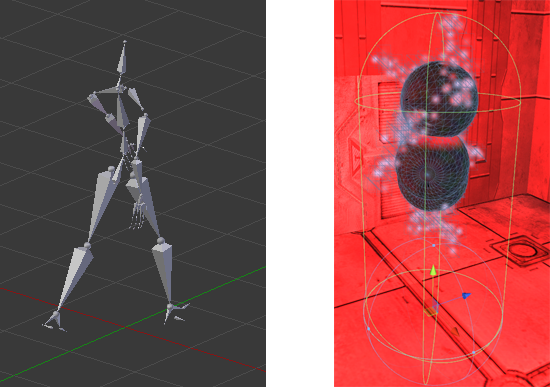 The third alien is actually based on the rig of the crewmate character, with particles instead of the mesh. Since it looks so different, you can’t really make it out I think unless you know it. The third alien. 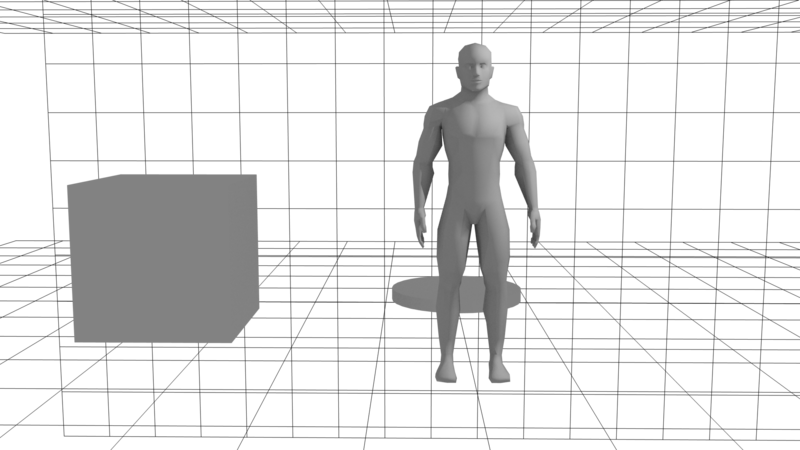 Out of lack of time, it was based on the human rig of the crew mate, with random particle emitters and spheres attached. All in all, we were really happy to get a first game out during a game jam. We ran into the trap of figuring game design out ad-hoc as we went along, being lucky to get something coherent out at the end. This is one aspect why the theme is not present that much in the game anymore. There are some unperformant parts in the game. I haven’t looked into it more closely, but my feeling is that some effects in some of the rooms are too much and are wasting resources. Strong points of the game include the procedural content generator as well as the nicely-done tutorial which also got added at the last minute. It was interesting for me to handle asset development in “battle conditions” for the first time. Of course, I will never be as good or efficient as a professional in this field, but it certainly deepened my understanding of this role in game development and also the relation to other roles. Do you want to know more about the game? Have a look at my colleague’s postmortem on the jam or give the game itself a try.